Do you still doodle? Travellers now have e-tickets, guidebooks, maps and more on their smartphones, but as any writer knows, it’s far easier to thrust a notebook from a pocket than a gadget if you need to make a quick note. 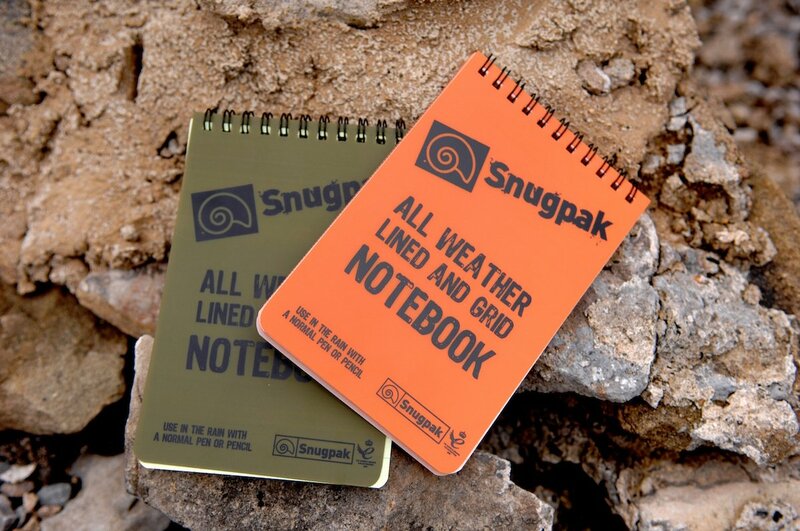 Snugpak’s latest Water Resistant Notebook makes that an all-weather activity. Available in green (for army use?) and bright orange (for hikers? ), the spiral-bound, 50-page Water Resistant Notebook has extra-thick pages and two thick plastic covers that provide a hard enough surface to write on. The inside back cover has a 5-inch/13cm ruler, too, as well as a conversion chart for length, weight and temperature. The pages are not too thick to use easily, but just enough to repel raindrops while remaining easy to flick through. On one side is a lined page, and on the other a grid, so it’s perfect for note-taking and mapping. We used both a biro and a normal pencil in snowy, wet conditions, and both worked fine. Sized at A6, the Snugpak fits nicely into an inside pocket, but here’s a catch; the top edges beside the spiral-bound are really sharp and snagged both on the soft inner fabric of a coat, and also on cold fingers. Since the lower edges have already been curved, we can only imagine this is an error. No matter – a pair of scissors does the job. Aside from that small issue, the Snugpak works well and makes a good value addition to an outdoors-grade arsenal of gear.